When my dad got orders for Japan in the early ’50s, he went ahead of the rest of the family. Mom had to get from Ohio to the Pacific Coast in order to sail to Japan. The photo at left was taken when my mom, brother and sister were leaving my Uncle’s home in Michigan headed west. They drove 450 miles in one day and got to Fargo, North Dakota about 6:15 p.m. In a postcard to her folks, Mom said they stayed at a cabin for the night – the cost: $4. They traveled through Montana and went to Oregon in order to visit my great-grandmother for a short time. Then north to Seattle to Fort Lawton where they had to wait a few days before sailing to Japan on June 9, 1953. The trip, aboard the USNS General Hugh J. Gaffey, would take 12 days – although by crossing the international date line, they lost a day. While on board, my sister tap danced in a Variety show and my brother – when not seasick – made friends. The ship carried 2400 troops – all on their way to Yokohama. My parents were in Japan for two tours and while there, they drove the Nash that had been transported via ship with them. Sometimes they rode a train like the one pictured (left) and my siblings rode a bus (right) back and forth to school or on field trips. While on their 2nd tour in Japan, my parents and brother all learned to fly courtesy of the Tachikawa Aero Club. They even “starred” in a short film promoting the Aero Club Family Plan. Back in the States and after I came along, my parents still flew every once in awhile. Here’s a picture of my Dad in ’72 getting ready to fly. My parents had some very interesting adventures in the air and on land. I feel very blessed that not only do I have stories and pictures, but memories of when I accompanied them on some of their adventures! Written for the 18th Edition of Smile for the Camera – Travel. My mom was the third child born to Glen and Vesta (Wilt) Johnson. Glen Jr. was the oldest, born in 1917, and Genevieve born in 1920. The siblings had a baby sister born very premature in 1927 and who died at 6 weeks. Mom always felt that her parents considered her brother the “golden boy” of the family and that he could do no wrong. He was, after all, the oldest child and only son. Mom and Aunt Genevieve were battling sisters. One story I’ve heard is that when Mom had to wash the dishes, Aunt Genevieve would dry them but put them back in the “mix” to be washed. When the two sisters got into it, my grandmother would sit them in chairs back to back and tell them they couldn’t touch each other or talk to each other. And they they all got older, married, and had their own families. This was probably one of the last photos taken of the siblings together before my Aunt Genevieve passed away in 1958. My parents had been stationed in Japan since 1957 so Mom hadn’t seen her sister in at least a year. As adults, the siblings visited each other for holidays and spent quite a bit of time together. My mom and her brother grew very close especially after my grandparents passed away in the early 1980s. Unfortunately, Mom lost her brother in June 2001 – just two months before she lost her only son. As the youngest of a family of three children, I felt more like an “only” child since my siblings were older than me. My brother had been married 9 months by the time I was born and my sister was in high school. A few years later she would be married and go on to have two children – who were more like siblings to me than my nephew and niece. How I envied my brother and sister! They had been able to live in Japan – not once, but twice! They had gotten to grow up with our first cousins! They had gotten to learn how to fly a plane! What I didn’t learn until much later was how they envied me. I got to live in the same house growing up, go to the same school, keep the friends I made and of course – have a swimming pool in the backyard! My brother became the male figure in my life after my parents’ marriage ended. How I did not like my brother telling me what to do! My sister tried to be a sister but it was awful hard splitting loyalties between a young sister and her own two children. She tried to mother me when I was an older teen but even that was difficult for her to do. She wasn’t sure if she should be a sister, mother, friend or what. We had many rocky moments in my early adulthood. Even though we worked in the same area of the same building for the same company, it was very rare that we actually were “friends”. It wasn’t until my first marriage ended that I realized what a treasure I had in my siblings. Unfortunately my brother was several hundred miles away but my sister was still close. We became much closer than we ever had. Then she moved out of state – just when we’d “found” each other again and settled into a friendship. Luckily as technology grew and we both became email “junkies” – there was hardly a day that didn’t go by that we didn’t email each other. When she moved back to the area in the mid-90s, I’d spend hours sitting with her at her table just talking about everything and nothing. We learned so much about each other that we hadn’t known before. Once again she moved away but we remained close through email and ocassional phone calls. The day she showed up at my house in March 2005 and told me they were moving back to North Texas, I think I cried continuously – out of joy – for days. Even now it brings tears to my eyes. I’m so lucky to have been blessed with such a beautiful, inspiring, and unique sister – who also happens to be my best friend. This was one of the last pictures I took of my brother – Thanksgiving 1998 – at our dad’s house. Jim had moved away from our “hometown” area over a year before so he was even further away. It was wonderful for both of us to share a holiday together with our dad. Little did I realize that this would be one of the last times I saw Jim. As I became older, he and I settled into a comfortable sibling relationship. He was always one of the first ones to call me on my birthday. Always quick with a joke or one of his “tricks”. I could count on him to make me smile or laugh. There was no laughing in August 2001 as he was deathly ill with pancreatic cancer. There would be no more birthday phone calls, no more jokes, no more “tricks”, no more hearing him call me “sis”. Now my sister and I have taken that mantle. I don’t think we ever called each other “Sis” until after our brother departed this life. I think that is our tribute to him and our hope that someday we can hear him call us that again. My four kids were pretty close in age. The oldest girls were 23 months apart, the next two were 19 months apart and then the last two were a little less than 5 years apart. Traveling was always an adventure – especially after the youngest no longer needed to be in a car seat. I had to be very careful who sat with whom and where the dog would end up as well! The youngest and 2nd youngest shared a room and due to their ages being almost 7 years apart, they grew close. However, they had their fair share of disputes. They were like the Odd Couple – one meticulous – the other not! The older three would play games together leaving the youngest one out. They would all yell “He/She is touching/looking at me!” Then they grew up. And became FRIENDS! After a rocky start at young adulthood and their relationships with one another, I start smiling when I think of the brother finding out what a great oldest sister he had or the youngest and oldest sharing confidences or the fact that they call and email each other more than they do me! I remember the day a long time ago I told them that someday they would be friends and the looks they all gave me! Three generations of “battling siblings” all turned into relationships of Best Friends Forever. What a wonderful family legacy that is! The 10th Edition of Smile for the Camera is about Costumes! Not the type worn for Halloween but a distinctive dress for the period or class or what was worn in an era of time. I chose the photo below of my maternal grandfather’s first cousin, Ada Blazer. Ada Dell Blazer was born on July 2, 1890 in Champaign County, Ohio to Wesley Blazer and Binne McAdams. She was the only daughter of the four children. Ada married Frank Ogg about 1910. After he died in October 1920, she married John Black. One daughter was born to this union. John died in December 1960. This also could be a pre-wedding photograph taken as it appears that the suit, the hat and the hand warmer are a matching set. I do not know the significance of the one sided lace collar. With her hands covered by the hand warmer, I can’t see if she is wearing any wedding jewelry although it appears she is wearing a necklace with a dainty chain with the charm at the “V” of her jacket and another necklace that appears to be possibly herringbone that fits closer to her neck. There is a just a hint of a smile on her face. Ada lived until the age of 86 and died February 22, 1977 in Champaign County, Ohio. Who Are You (Tell Me – Who Are You)? I posted this picture on August 22, 2008 for Freaky Friday – 3rd Edition. It is a picture of my grandfather (older child) and another unknown child. I believe my grandfather was probably about 10 when this picture was taken and I am led to believe (due to the clothing) that the unknown child is a boy about 4-6 years old. My grandfather didn’t have any younger brothers. His foster sister was 12 years younger than my grandfather so it couldn’t possibly be her – dressed in pants. So I ask – who are you little boy? Could you possibly be a relative? Possibilities include: Floyd Tyler b. June 13, 1906. He was my grandfather’s first cousin, son of his paternal aunt, Olive Belle (Johnson) Tyler. That would mean (since my grandfather was born in Nov. 1898) that Floyd would have been 8 years younger than my grandfather. I haven’t determined if Floyd was born in Indiana but I do know he spent most of his life in and around Calhoun County, Michigan and was buried there. However, some of his older siblings were born in Howard County, Indiana. Could this child be Earl Goul, born June 15, 1904 and six years younger than my grandfather? Earl was the second cousin of his as his grandfather, John Wesley Goul, was brother to my grandfather’s grandmother, Malissa Goul. Earl was born in Delaware County, Indiana but spent time and died in Madison County, Indiana (where my grandfather was born and raised). A very good possibility – looking at the following photos – is that this child is my grandfather’s half-uncle’s son, Guy Leston Johnson. However, I would have to be off on the ages of both boys as Guy was 10 years younger than my grandfather. Here are the photos – the black and white was the earlier of the two photos. 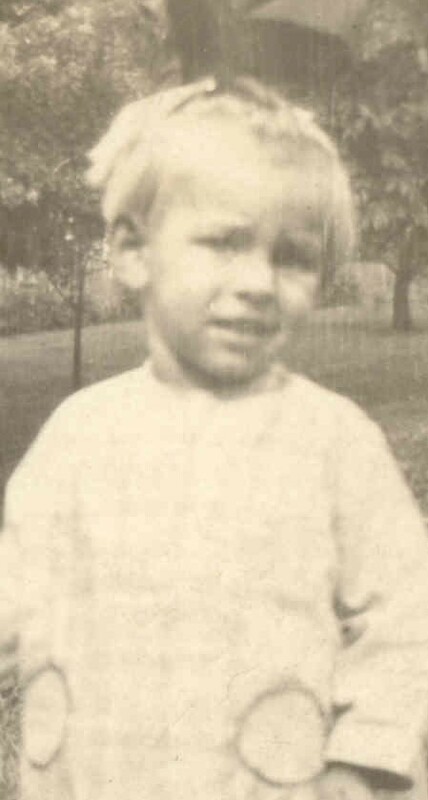 Whomever he is, this unknown little boy will continue to be a mystery to me until I determine his name and relationship. Have you seen him before? Perhaps in that stack of photos your great-grandparents left you? Or in a framed photo hanging on a friend’s wall? This is why it is very important to not only label photographs – but to list the relationship of those in the photo. Even if I had a name – would I be able to connect the dots back to my grandfather? This post was written for the 9th Edition Smile for the Camera – Who Are You. What’s in Your Christmas Stocking? Roma Goul – cousin of my grandfather, Glen R. Johnson. I would stuff the stocking of a Goul relative in hopes that they would be able to give me more information on this woman. She was obviously a part of my grandfather’s life since he had her picture in his possession. Roma D. Goul was born in 1904 in Mechanicsburg, Champaign County, Ohio to William Harry Goul and Ada Josephine McAdams. She had four sisters – Geraldine (b. 1901), Vaughna C. (b. about 1908), Verna (b. between 1909-1910) and Dora (b. 1 Oct. 1910 and d. 22 Dec. 1910). Her parents were married in 1899 in Champaign County, Ohio. This post was written for the 8th Edition of Smile for the Camera. The theme for the 6th edition of Smile for the Camera is “Funny Bone”. Show us that picture that never fails to bring a smile to your face! An amusing incident, a funny face, an unusual situation. Share! Choose a photograph of an ancestor, relative, yourself, or an orphan photograph that tickles your Funny Bone and bring it to the carnival. Admission is free with every photograph! Your submission may include as many or as few words as you feel are necessary to describe your treasured photograph. Those words may be in the form of an expressive comment, a quote, a journal entry, a poem (your own or a favorite), a scrapbook page, or a heartfelt article. The choice is yours! So the following picture is my submission – and it is timely as this photo was taken at Halloween almost 10 years ago. Explaining why this picture tickles my “funny bone” also shows what a sick family we are! The little fella next to the “Scream” monster was made by my kids. They took a pilllow case and made a face on it, then took my son’s clothes and stuffed them with rags and newspapers to “fill it out”. Then they placed it in a lawn chair in our front yard the evening of Halloween. The “Scream” monster sits next to the little fella. So as kids are trick or treating that night, they have to walk by these two things sitting in lawn chairs. Most of them give the characters a sideways glance and keep going. A few kids had to be cajoled to pass by. One mom was bound and determined to prove to her daughter that the “Scream” monster was not real. She came closer and studied it. She waited too long – my son jumped at her. Yes, he was the “Scream” monster. The lady screamed & they raced down the sidewalk. Needless to say our family had a good belly laugh. I know that we shouldn’t laugh at other’s expense – but it was Halloween & our family does that holiday in a big way! So the moral of the story is – if you think something isn’t real – you might be wrong and if you can’t take the scare – don’t get too close!